Today, Love Saves the World joins a blog barrage for Samantha Holt's A Summer Siege! For a complete list of blogs joining this barrage, click here. The country is torn apart by a rebellion as the French invade. Reunited after five years, Madeline and Tristan find themselves caught up in the war and in a fight to save their love. Tristan is thrilled when the girl that he has loved, and missed, for five years returns to him, but the time apart has changed Madeline and she feels herself incapable of depending upon another. Can Tristan convince her otherwise? As the French close in upon them, Madeline has to summon the courage to fight for her home, her country and for a love lost. Will she succeed or will their love and lives become another casualty of the rebellion? He towered over her, a bronzed God, highlighted by the bright midday sun. His hair gleamed as if each strand had been fashioned of gold and the azure of his eyes burnt into her, brighter than the clear summer sky. Her heart hammered in her chest, yet she was not afraid. Indeed, he looked more like a warrior now than he ever had, the fierce lines of his brow, the breadth of his torso, all adding to his look of male dominance. But Madeline knew Tristan, knew the kind heart that lay beneath. How then could she explain the intensity in those eyes? The simple sweetness that used to lie within them was a thing of the past and the look he gave her now could surely account for the restriction in her chest. Madeline found her back pressed against the bark of the tree, its rough texture grating at her skin through her thin gown. Yet she felt not a thing, a strange sense of numbness coming over her as her thoughts became consumed with only one thing. Slowly, ever so slowly, his hand met hers, his fingertips dancing across hers, as he wound their fingers together. Powerless to resist, all coherent thoughts gone just as soon as he had locked eyes with her, her fingers played back, grasping the roughened skin. His other hand met hers, softness against hardness, and bound together as they both watched, captivated by the twisting union. Tristan leant in to her and his hands, still entwined with hers, reached up until the back of her hands were pressed against the tree above her head. Tilting her head to meet his gaze, she found her breath robbed from her as his lips hovered achingly close to hers. Gone was Tristan the rescuer, the friend, the protector. His eyes reflected burning desire, a look she did not doubt she shared. Unable to respond, she could only gasp as his hot lips pressed against her neck. Her hands still pinned above her head, she could do little to resist even if she had wanted to. His mouth traced its way across her jawline, finally slanting across her mouth, satisfying and yet stoking the unbearable ache deep within her. Samantha Holt resides in Warwickshire, England, with her twin girls, having followed her soldier husband around the UK for nearly 10 years. Growing up in Hampshire, she was inspired by the authors Jane Austen and Elizabeth Gaskell, both of which lived and wrote only miles from her home town. Samantha loves the romance genre and has been devouring romantic literature for as long as she can remember. History is another passion of hers and she loves to combine her love for history and romance in exciting and passionate tales. Her books include the bestselling novel, The Crimson Castle and The Angel’s Assassin. Thanks for hosting me! 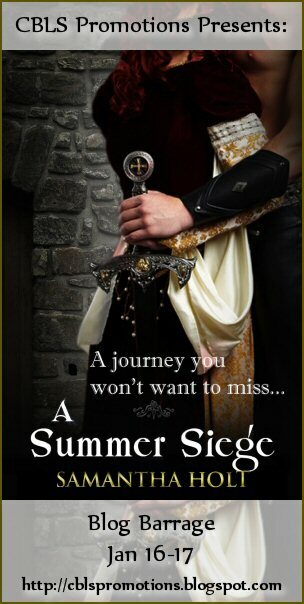 Just to let your readers know that 'A Summer Siege' is free on Amazon for the next three days! And, thank you, for the heads up regarding the free offer. Will post the information on my Facebook page. Winners! December New Releases Giveaway Hop!